Inventory your Mac network in minutes! Network Inventory Advisor for Mac makes it easy to track all the inventory data about remote Macs and report all information you need to manage any number of Mac OS X computers from your desk. All connected devices, CPU details, network configuration, startup items, power settings and a ton of other valuable information becomes available to you for every new Mac computer you add to the inventory.
" 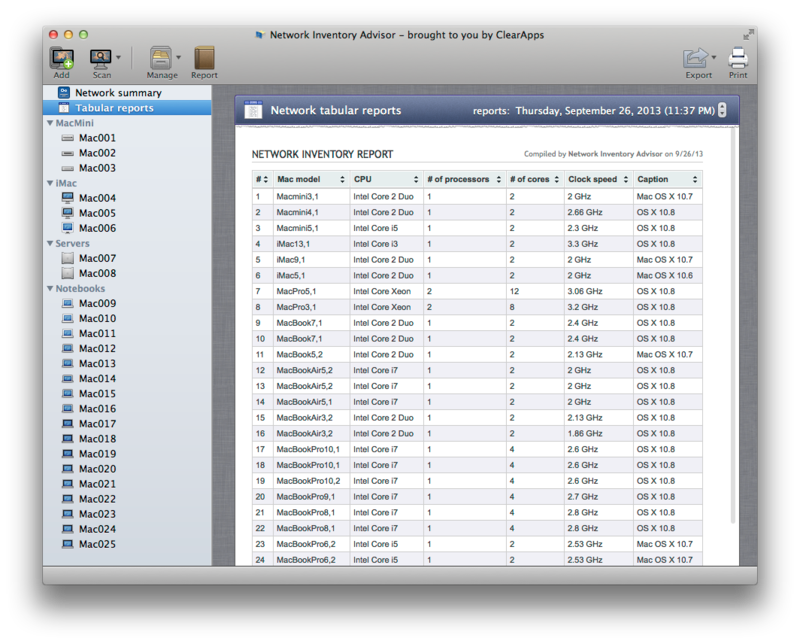 As someone who has spent many years in Mac support and network administration, I find Network Inventory Advisor’s ability to easily present remote Mac system reports very useful. It’s something I’ve wished Apple Remote Desktop would do for the longest time, but as it hasn’t had an update in so long, it’s looking less and less likely. " Once the data is collected it can easily be exported into a web-page or PDF for further presentation or sharing. Flexible tabular reports let you build powerful inventory templates and create custom tables of whatever data you need to analyze about your Mac network. Hundreds of inventory objects are waiting to be associated with Mac computers on your network for in-depth management and transparency of the information and devices flows in our company. Is this for an unlimited number of nodes or what? The details don’t mention that. It took me 30 seconds to figure that one out, maybe give a little bit of research into the things you’re buying. The $69 license is for 25 nodes. Thanks for the interest in our app! The ZOT Price is for 25-node license.